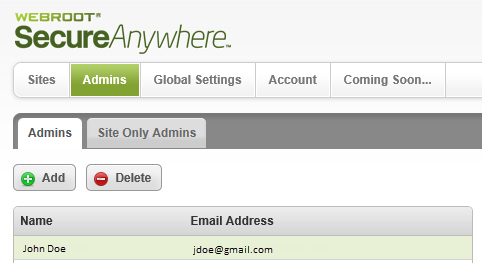 From the Global Site Manager Console, select the Admins tab. The system displays the Admin panel. Select an admin to view their details. The admin's details display, and the Delete button becomes active. The system displays a warning message. Click the Confirm Delete button. The system displays an information message. The admin is now deleted from the system.